Orange County Mayor Teresa Jacobs’ Youth Mental Health Commission presented its final report to the Board of County Commissioners in late April. Richard Morrison, Regional Vice President of Florida Hospital and co-chair of the Youth Mental Health Commission, made the presentation. The Commission was created in August 2013. The Commission conducted an extensive analysis of how needs are met in the Central Florida community and what can be done to help children, youth and their families with mental health issues. To make the changes necessary to enhance the mental wellbeing of our county’s children and youth, the Youth Mental Health Commission identified the need to have a group of committed citizens to act as an oversight and implementation commission to fix what is broken, to create what is not there, to teach what good mental health is, and to see that parents are involved in the solutions. Background: As a result of tragedies around our country and the attention to issues surrounding mental health access in our County and State, Mayor Teresa Jacobs convened the Youth Mental Health Commission on August 26, 2013. The Mayor’s purpose was to convene a group of stakeholders, community leaders and consumers who would delve into system issues for children’s mental health and address short and long term strategies for improvements to those systems meant to serve this vulnerable population. 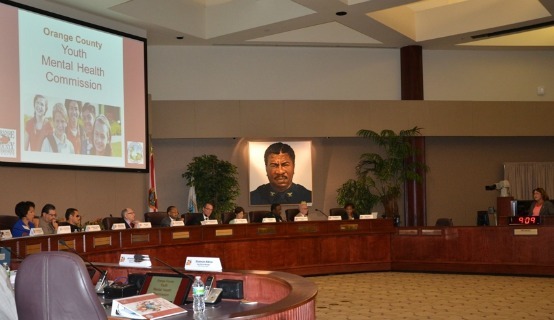 Richard Morrison, Regional Vice President of Florida Hospital and Chief Judge Belvin Perry, Jr., of the Ninth Judicial Circuit quickly accepted the challenge of co-chairing the Commission. The Commission members truly epitomized the dedicated leadership, critical thinking and experience necessary for the task. Along with the Commission members an astounding 114 representatives of affected family members, mental health professionals, and interested parties participated in the working committees. The Commission recognized that the populations to be served by the proposed Youth Mental Health System of Care include those individuals from birth through age 24. Scientific evidence reinforces our need to pay attention to that range due to trauma en utero, exposure to violence, untreated symptoms and their effects of the onset of major mental health issues in children. Combined with the onset of mental illness for many children, and teens transitioning to adulthood, the range of 0-24 made the most sense. The final report may be viewed in its entirety on Orange County’s website.